We all love the movie Up, right? Well perhaps the world’s greatest home builder Blair Bangerter has taken his love for the film to the max. . . He built an exact replica of the house in Utah! We adore to find Up inspired pieces and between our previous article where National Geographic set a house into the clouds and this REAL house, we are closer to our dreams becoming a reality! We think we should ask Mr Bangerter if he would let us come over for a cup of tea… but he may have quite some trouble trying to get us to leave. Hee hee! It seems that building your home inspired by a film is more common than you would think! Check out Kenny Caperton and Emily Currier’s house in North Carolina … Do you recognize it? Well perhaps you would on Halloween! Yup, this film was inspired by the horror film itself … I think we would be too scared to try and sleep in this one! Ahhh… The White House … Wait! That’s not the White House! 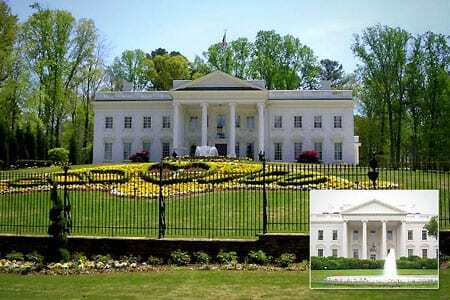 There is actually a lot more replicated White House’s than you would think, but this version living in Virginia was the one that was used in the movie Independence Day. 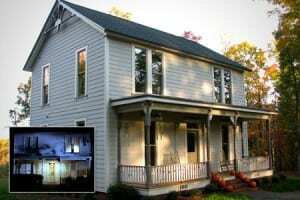 This house is an exact replica of the original, at a fifth of the size! Phew! Imagine the maths for that one! Well well well! If it isn’t The Simpsons! 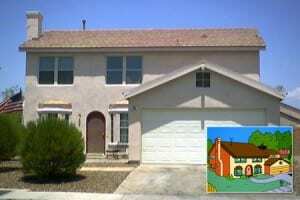 This real life version of the worlds favorite cartoon families home was built in Nevada as a contestant prize … They don’t make prizes like they used to, right? When initially built, this home had the bright colours inside and out and over 1500 props to make it hard to believe you weren’t living in the TV! Stupidly the contestant took the money over the house (Fool!) and after being open for a month and a half for tours, this house got toned down and sold to an average Joe. We think someone should sort that one out! Wow, I hope the person who purchased the home appreciates it. 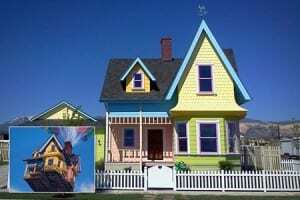 I would love to own the house inspired by Up! Us too! I don’t think it is actually for sale…. 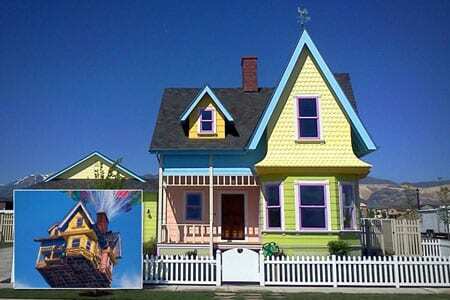 no one could bare to part with an adorable house like that, right? !